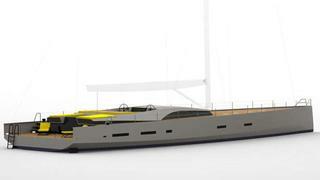 Exploiting expertise in high-tech carbon composites, Owen Clark Design has scaled down an Open Class 40m and upped the liveability to create a 33m racer-cruiser design with an 8.2m beam. The 33m design is intended to be modern, functional, capable of fast passage making, competitive at superyacht regattas and able to transport owners and their guests in comfort over long distances. The key to the concept was making the deck and a single sail plan suitable for both racing and shorthanded passage-making with such gear as a two-speed furler on the bow, a non-overlapping jib on its own forestay, pre-set tack positions for storm sails and bomb bay doors on the foredeck to lockers for working sails. Only the mainsheet is on a captive winch. The dreadnaught-style bow increases the waterline, giving a length to displacement ratio of 63 while hard chines aft and twin rudders give directional stability and control. The lifting keel drops to a sailing draft of 5.5m (a 5m fixed keel is optional). There are three separate deck areas including an aft terrace with direct access to the owner’s lounge and an elevated sun lounge deck apart from the cockpit (the cockpit tables are removable for racing). A low-profile deck saloon houses the dining and bar area. In the four-cabin layout, the owner’s cabin is to starboard, adjacent a private full-beam saloon aft. A charter version is possible with a fifth cabin taking the place of the owner’s lounge. The galley, a crew mess and three cabins for captain and crew are forward of the mast, with tender and toys stored under the aft terrace.